The American Environmental Defense Fund says – in response to critics of the EU ETS who say the scheme should not operate outside European airspace – that this argument is incorrect. Though part of a flight from, say, the USA is not over Europe, the flight only takes place because its destination is in Europe. Without that being the destination of the passengers, the plane would not be there. All the emissions from the whole flight occur because the passengers want to get to Europe – so all are within the EU ETS. This principle has been agreed by the UNCCC and ICAO. The EDF also rejects arguments based on sovereignty because many countries already impose charges like arrival or departure taxes, on the whole flight, and not only part of it. The ETS is no different. Europe’s Aviation Directive is a pioneering law that holds airlines accountable for the global warming pollution of all flights that land at or take off from European Union (EU) airports. The EU aviation law would, by 2020, cut carbon pollution by an amount equivalent to taking 30 million cars off the road each year. However, industry players have fought the law’s implementation. They’ve objected to the EU Emissions Trading System (EU ETS) applying to international aviation outside of European airspace. To argue that a nation’s authority to address the emissions of a flight landing in or taking off from its airports extends only to its sovereign airspace ignores the fact that the flight only occurs because travelers wish to fly to or from that country. If the flight never took off to go to that country, then none of the emissions would occur. But all the emissions from the flight occur precisely because the flight is going to that country. Further, the airspace-based methodology for accounting for aviation emissions was rejected by the UN Framework Convention on Climate Change (UNFCCC) years ago, a decision effectively ratified by the International Civil Aviation Organization (ICAO) Executive Committee when it directed that ICAO’s work be consistent with the UNFCCC. The airspace approach was rejected because it would lead to perverse results. For one, the emissions of a flight would “belong” to a nation simply because the plane had transited that nation’s airspace, even though the flight had never landed in the country. Also, pollution from flights occurring in airspace over the high seas would be “orphan emissions,” the responsibility of no country. But all of that aside, the sovereignty complaint does not ring true. Many countries charge some sort of arrival or departure tax (or both, like in the U.S.) on flights to and from their territories. Those charges apply to the entire flight, not just the portion in the country’s sovereign airspace. In fact, many of these charges – including those of the UK, Germany and India – are proportional to the length of the flight (including flight length outside the territory of the country taking the measure), in much the same way that the EU ETS accounts for emissions proportional to the length of the flight. 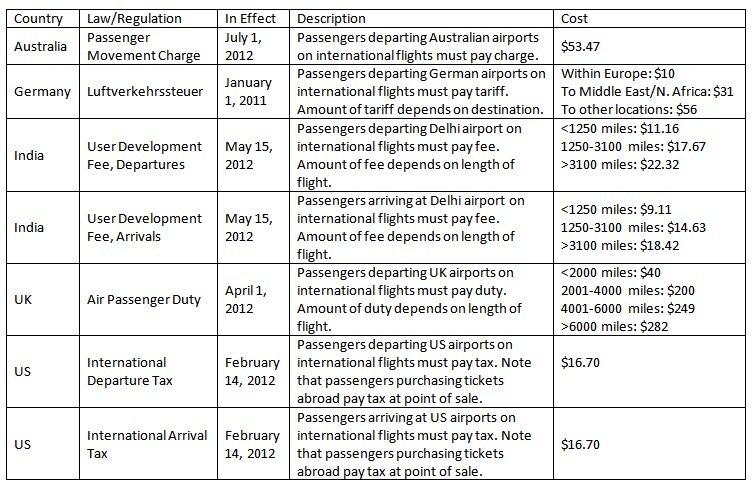 These taxes affect the entire length of an international flight, both inside and outside of the country’s sovereign airspace: if you don’t pay the U.S. international arrival tax of $16.70, you simply can’t take off from a foreign airport to come to the U.S.
From a practical standpoint, the estimated per-ticket cost of compliance with the EU ETS of less than $3 for a flight from New York to London is substantially less than the arrival and departure fees shown above, in some cases by an order of magnitude or more. As we’ve discussed, the cost of EU ETS compliance is trivial compared to the cost of an international plane ticket and airlines potentially can profit. The EU ETS, a modest measure that uses proven policy tools for cutting emissions at least cost, is no more an intrusion into U.S. sovereignty than these taxes are into other nations’ sovereignty. Posted: Thursday, June 7th, 2012. Filed in Climate Change News, Recent News.